Fits Big Twin 1936 - 1967. 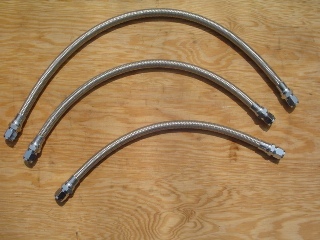 These sturdy aircraft quality stainless steel braided oil lines are good looking and practical. They are flexible and resistant to heat and vibration. They are stock replacement for use with stock oil tank, or custom tank with the fittings in the stock location. Engine fittings must also be stock.